This year, Kevin MacDonald will meditate on the uses of the archive. Perhaps he will discuss the economic benefits of youtube or the role that professionals can play in saving (us from) our amateurs. The trouble with memorials and memorial lectures is that they take lack as a point of departure. They try to pay a debt (not make a profit or build a new product). They owe something (to history, memory, and ghosts). BFI should skip the memorial. Surely, MacDonald can only increase the weight of our historical burdens. Celeste Langan on time, liberal education, and getting dragged to the ground by the Berkeley police. Video of students and teachers here. 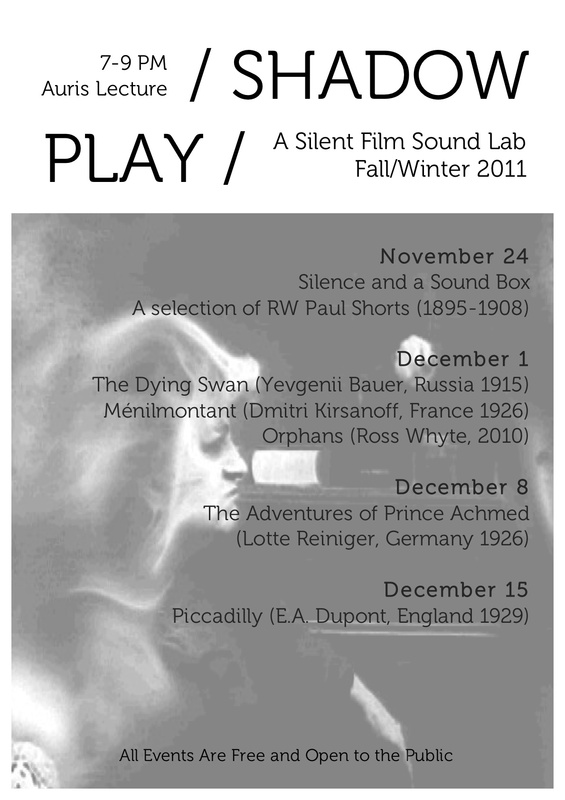 A series of silent film/sound events, curated in collaboration with Ross Whyte and Professor Pete Stollery from the Department of Music at the University of Aberdeen. Events are free, open to the public, and participatory. If you are in the area, please join us for evenings of cinema, sound, and discussion. Dartmouth Film and Media students collaboratively remake Bruno Corra’s (long lost) Chromatic Music with sound from Russolo.